At the beginning of October, 1984, not long after I’d begun a year as Visiting Professor at the University of Athens, I went at the invitation of a colleague to the opening night of the Greek National Theatre’s production of Heartbreak House. A few minutes before curtain up, with the theatre already full, two aged men, one short, one massively tall, appeared through a door to the stalls. The entire audience rose in almost hysterical applause. Who were they, I asked? The short one was Yannis Ritsos, I was told, and the tall man, stooping considerately so that his companion could link arms with him, was none other than Mikis Theodorakis. After a few minutes of prolonged cheering, which the two old men modestly acknowledged before taking their seats in the front row, the audience settled down and the curtain rose on what turned out to be a pretty awful production of Shaw’s play. Never mind. I’d not only seen a great poet and composer and been witness to the rapturous reception with which they were greeted, but after the performance my colleague had taken me back stage where I’d been introduced to Ritsos and shaken his hand. (Theodorakis seemed to have disappeared.) And suppose, I thought, as I walked back to my flat, I’d been to a production at London’s National Theatre, and before curtain up the then Poet Laureate, Ted Hughes, had entered with, say, Harrison Birtwistle, who among the audience would have recognised them, let alone given them a standing ovation? Greece is a small nation — one forever lurching between success and failure, democracy and dictatorship, trapped by high-level corruption and clean-up acts that usually turn out to be themselves part of the corruption. As I write it is being put to the sword, metaphorically at least, by the boot-faced brigade of EU Ministers which is housed in Brussels. Plus ca change. In the less than two centuries since it first emerged from Turkish rule into independent status, Greece has faced repeated threats to its survival, at home and from abroad. In the decade and a half prior to 1984 the infamous Junta, that collection of military goons and thugs shoe-horned into power with the malign assistance of the CIA, had, before its overthrow, done enormous damage to the nation’s cultural life. Under its dire rule, many Greek artists, poets, musicians and intellectuals, had been imprisoned, tortured, and, in some cases, killed. Yet despite it all, they had carried on composing and writing, finding ways to smuggle their work out of prison or to preserve it so it could be heard once the Junta was toppled. No wonder they were heroes. “Poetry makes nothing happen,” Auden wrote in 1939, a claim so endlessly repeated that it seems to have become accepted as an eternal truth. Yet Auden must have known that three years earlier than he wrote those words not only had Lorca been assassinated by one of Franco’s hit squads, but Ritsos became the enemy of the Metaxas dictatorship, his great elegy “Epitaphios” publicly burned in Athens, because its subject was a mother’s lament for the death of a young tobacco worker shot while he and others joined in protest against the brutal treatment of workers by their employers. As Czeslaw Milosz said in his Nobel Acceptance Speech, all dictatorships fear the truth. “It is like a pistol shot set off in a crowded room.” When I saw Ritsos at the National Theatre in late September, 1984, I was seeing a man who had suffered imprisonment and torture not merely under the Junta but by an earlier, post-war government, determined not to yield to demands for a socialist republic made by the Greek communists and fellow-travellers, of whom Ritsos was one. I have sympathy with those who have consistently argued that to become in effect part of the Soviet bloc wasn’t a good idea. But we need to remember that most of those who yearned to align their nation with international communism had fought with extraordinary bravery first against Mussolini’s troops and then, when they had ousted Musso from Albania, taken on and, inevitably, gone down to defeat under the overwhelming force of the Nazis. And by the way, Nazi reprisals against the Greeks during the Occupation were so disgusting, so utterly inhumane, that, if you add to these the repeated German looting of Greek archaeological treasures during the war years and earlier, Herr Schaubel and the rest of the Brussels blood-suckers ought to sink to their knees in shame at their harassment of the present Greek government. They’d be well advised instead to direct their vindictive action against the “advisers” of Goldman-Sachs who, after what must have been all of an half-hour’s inspection of the Greek economy, pocketed their millions as they passed Greece fit to join the Euro group. Fat chance. Like Ritsos, Theodorakis was a man of the left who had set some of his friend’s poems to music. He had made out of these poems memorable songs known to and sung by thousands. (After Ritsos’s death some of these songs were spontaneously sung through city streets by Greeks by those mourning the dead poet.) And like Ritsos, Theodorakis had been imprisoned and tortured. He, too, was a hero of the people. No wonder, then, that the two of them should have received that standing ovation I witnessed. And now, after reading Gail Holst-Warhaft’s evocative, compelling book, The Fall of Athens, I wonder whether its author might have been in the audience that evening in Autumn, 1984. For it turns out that she was a good friend of Theodorakis, and she has much of interest to say about how, as an accomplished harpsichord player (though she is characteristically modest about her musical ability), she came to perform with him as he toured Greece in the early 1960s. She also explains how she became aware of and then deeply informed about rembetika, a form of popular music she calls Greece’s version of “urban blues,” which was brought over from Asia Minor after the 1922 disaster, and which, during the inter-war years, took root in the waterfront bars of Piraeus. She may even, she suggests, have introduced Theodorakis to rembetika. At all events, he became enthralled by it, although “serious” musicians and critics were apparently dismayed by the eagerness with which he drew on it for his own compositional work. Weren’t they aware of how some of the foremost 20th century “serious” composers – Vaughan Williams, Dvorak, and Copeland among them – rejoiced to use folk music in their own work? Probably not. But Holst-Warhaft herself, certain of rembetika’s abiding worth, took some of the music’s finest performers abroad – including, of all places, Berlin. Among these performers was the great bouzouki player and instrument maker, the legendary Thanassis, about whom she writes with a warm, wryly appreciative wit. (She is, I should note, the author of a definitive account of the music and its performers.) In the late 1990s I used to see Thanassis, dapper in trilby hat and with raincoat draped over his shoulders, as he sat to take his coffee at an ouzerie on Aegina’s waterfront (you can judge his appearance for yourselves because he is featured in two of the book’s many atmospheric photographs), and from time to time, when he was in the right mood, he would invite my wife and myself back to his tiny back-street house. There, he’d pick up a bouzouki and play and sing for us songs of his own composition – there were over three hundred – in a room hung with various instruments, from tiny ones whose names I have forgotten to mandolin-style ouds, all of which he had made with loving care (he had begun life as a ship’s carpenter), and which awaited collection from hosts of eager buyers, though I remember rather better the number of young men who would arrive to buy and/or sell the hashish from which the performance of rembetika seems inseparable. And why not. One of many reasons why you should buy The Fall of Athens is because it includes an invaluable discography of musicians and performers whom Holst-Warhaft has known, with whom she performed, and about whom she writes so well, and with such understanding, as she does, for that matter, about the great Greek poet, Katerina Anghelaki-Rooke, who used to spend all her summers at her house on Aegina, though nowadays, widowed, old and frail, she is confined to Athens. You should also buy the book because it is studded through with the author’s own accomplished poetry. 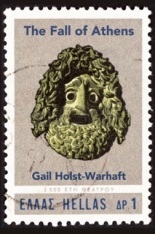 Much of this uses Greek myths in order to tease out Holst-Warhaft’s own complex responses to a nation she loves but whose many faults she refuses to blink at, let alone ignore. The Fall of Athens, though at first glance it seems an almost diffident patchwork of separate essays, is, I should add, both an entirely coherent memoir and at the same time a shrewdly observant account of post-war Greek history. Essential to this is the running campaign which the book conducts against phil-hellenism, that mental fix which sees no evil, and hears none. Phil-hellenism isn’t merely to be identified with a kind of tourist view of Greece. I remember years ago standing on a beach on the island of Leros with the Greek-Australian poet, Dimitris Tsaloumas. I’d first met Dimitris in Melbourne, where he’d gone to live in the mid-1950s. He was escaping from Greece before he could be nabbed by state police who were after him because of his radical writings and actions. Now, like Theodorakis and Ritsos, Dimitris was a hero, at least on his native island, the beauties of which he extolled to us as my wife and I stood beside him and looked across to the island of Patmos, glimmering blue-grey in evening sunlight. With evident emotion Dimitris said, “You see, my friends, we Greeks love beauty.” I looked down. The beach where we stood was littered with broken bottles, rusted tin cans, plastic bags, other detritus. But there didn’t seem much point in mentioning this, emblematic though it surely was. Greeks are drawn to the long view, the panoptic vision. But close-up? The here-and-now? Hmm. In telling contrast to this hazed-over view, Holst-Warhaft acknowledges the dreck of a nation which is, after all, hoping to be part of the modern world. Byron was probably the first outsider to see Greece less in terms of mythic status than as a nation struggling to be born, and which had to therefore to face the deep and conceivably unbridgeable fissures that open up between dream (the Glory that was Greece) and latter-day reality. Hence, perhaps, the Fall of Athens. There is, in other words, an elegiac note heard through Holst-Warhaft’s book for all – or is it because of? – the author’s celebration of people and a culture she loves and in both prose and verse writes about with such tender insight. For anyone at all interested in Greece, which ought really to include anyone with the slightest interest in the world in which we live, this is without doubt a necessary book. I wish Fomite had employed a copy-editor to pick up a number of typos, and I lament the lack of an index. But these are minor quibbles. They certainly don’t weigh heavily in the scales against what Gail Holst-Warhaft has accomplished.